Dronacharya was the archery teacher for the Kauravas and Pandavas. In those days, Dronacharya was matchless in archery. Dronacharya had a son named Ashwatthwama. He was named Ashwatthwama because as soon as he was born he started neighing like a horse, and “Ashwa” means horse. Dronacharya was extremely fond of his son. Ashwatthwama learned archery from his father and became a great hero. Ashwatthwama’s mother was the sister of another great archer, Kripacharya. Kripacharya also helped Ashwatthwama, as well as the Kauravas and Pandavas, in archery. It was also Kripacharya who had requested Dronacharya to teach the Pandavas and Kauravas after him. They were very close relatives. Ashwatthwama learned many secret ways to use the bow and arrow and soon became an expert. The Pandavas were in the forest because of Arjuna’s and Yudhishthira’s defeat in a game of dice with Duryodhana and the Kauravas. 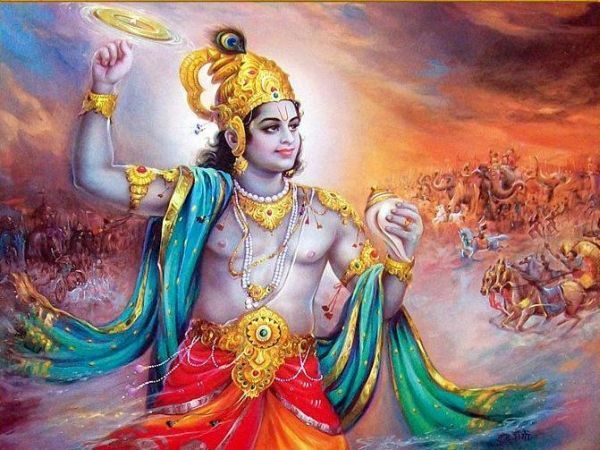 Ashwatthwama tried to lift the Chakra disc up, but it was impossible for him to lift it.